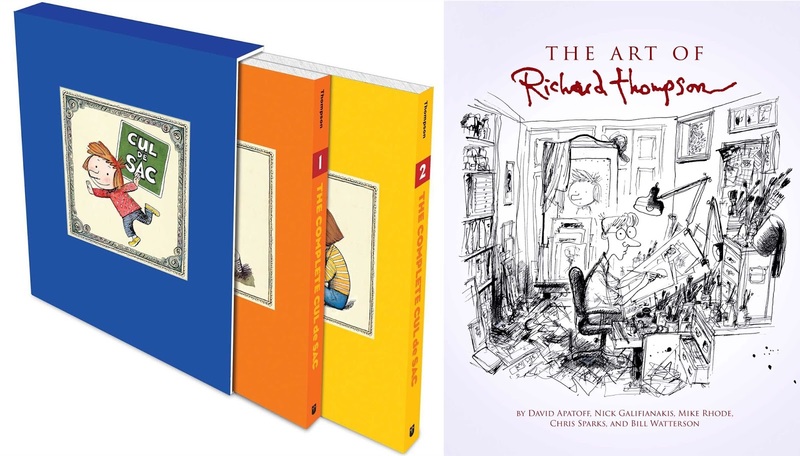 Cartoonist Richard Thompson died yesterday from Parkinson's disease at age 58. Michael Cavna wrote a good obit in the Washington Post, for which Richard did a lot of work. 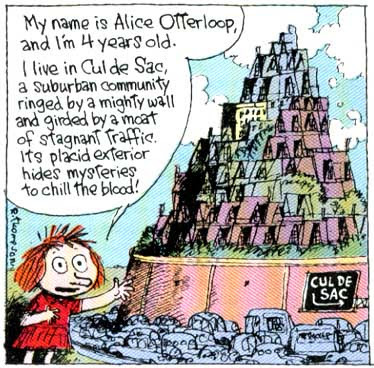 Richard was also the genius behind the comic strip Cul de Sac, which, when it retired in 2012 because Parkinson's had made it too difficult for Richard to draw, I called the best comic strip of the 21st Century. So far, it still is. Unlike most people, I don't throw around the word "genius" lightly. To me it means something beyond "extremely smart and talented." More like "sprung full-blown from the brow of Zeus," doing things I don't even understand how any human could do. Richard did that. The past couple of weeks I've been writing the Comic Strip of the Day blog while its founder, Mike Peterson, recovered from surgery. 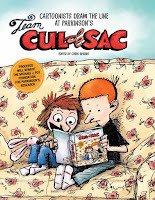 Mike came back yesterday, and for my final two posts on Monday and Tuesday I republished the testimonial I posted here when Cul de Sac closed up shop. I won't re-repost it again, but here's Part 1 and Part 2. Richard died on Wednesday. The timing was coincidental but providential. I'd heard from people close to Richard that he was in very bad shape but didn't know he was near death. I reposted that piece partly because I wanted people to think good thoughts about him, and hoped he might see it and it would make him happy. Monday's Part 1 post got a Facebook "Like" in his name. He obviously didn't push the button but someone near him did, so I'm grateful for that. I never met Richard but we exchanged some messages over the years. He was the same with me as he was with everyone: kind, funny, generous with his time and praise. I live 3000 miles away but always hoped I'd have a chance to take him up on the cup of coffee he promised, and I don't even drink coffee. I'm pretty heartsick and gutted by his loss. Chris Sparks started Team Cul de Sac to raise money for Parkinson's disease research in Richard's name. I contributed a drawing to a tribute book published a couple of years ago, and the group is still active at comics conventions and online, doing good work with the Michael J. Fox Foundation. Check them out. 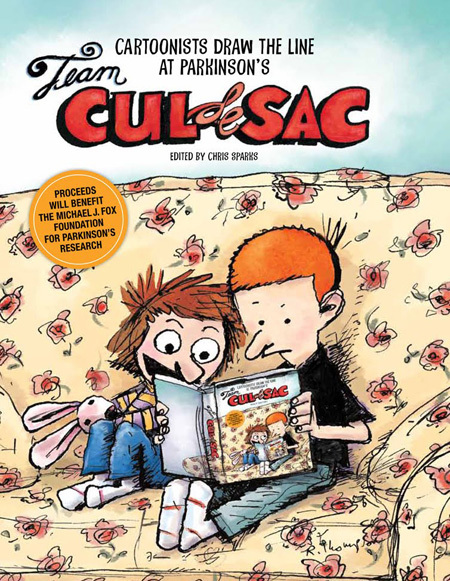 I recommend two good books: The Complete Cul de Sac, which collects all of the strips in Cul de Sac's five-year run, and the Art of Richard Thompson, which, if you're an artist, will either inspire you to work harder or give up. In addition, Picture This Press will soon release two books as part of its Richard Thompson Library: The Incompleat Art of Why Things Are, collecting Richard's illustrations for Joel Achenbach's column in the Washington Post, and Compleating Cul de Sac. If you're curious what a genius looks like, watch this video. I'll miss having him in the world. My friend Mike Peterson runs a fine blog called Comic Strip of the Day (CSOTD), which does what its title says. Every day Mike reads a couple hundred comics and picks out those that inspire an essay or provide an interesting juxtaposition. He's a very good writer and it's a daily stop of mine. When I heard Mike would be going into the shop for a tune-up, I offered to take over CSOTD while he recovers. I made it sound like I was doing him a favor, when in fact he's doing me one: I love comics, I love to write, and I like the discipline of having to produce something daily on deadline. This'll be fun. Also, when you get a bunch of readers in the habit of checking in with you every day, never give them an excuse to get away. I'm hoping Mike's readers will stick with CSOTD while I fill in. Maybe I can even convince someone who knows me but doesn't know Mike to start reading CSOTD. That'd be cool. My first CSOTD is Tuesday, July 12. Mike has already linked to this blog and I'll cite it a few times myself, so by way of introduction: I'm a writer, journalist, cartoonist, and creator of comics you can learn more about by clicking those links to the right. Further down are eight years (!) of my blog archives. I'm doing CSOTD my way, not Mike's, and Mike's OK with that. Mike's Prime Directive is that he never singles out comics for snark and abuse. It's also mine. I'll be less political than Mike. I don't do politics online; in my experience it just makes people mad and never changes anybody's mind. I also don't think I'll have time to read a couple hundred comic strips per day. But I hope to have interesting things to say about comics, and I have some surprises planned. I have no idea how long I'll be guest-hosting while Mike recuperates. Probably between two and six weeks. I think Mike's tough and stubborn enough to hit the low end of that range. I'll leave the lights on for you, Mike. My friend Marion is a writer whose recent blog post with that same title got me thinking. Marion recently retired and is pursuing her avocation of writing with every hope of making it a vocation (I assume; I've never really asked her, but I figure she wouldn't mind making some money at it). $87.68 is the sum she earned for selling a science fiction story, and the pride she took in depositing that check was hugely out of proportion to its dollar value. Marion's post is about the disappointment and hurdles writers face, the "locked doors, barred windows and Don’t Even Think of Parking Here signs you see in the writing biz, long before you even get a rejection." I think it's a good essay that's worth reading, but the bit that got my attention talks about the discouragement she especially feels from other writers. "There are so many, and they are so consistent in their urge to explain that writing is hard work, that you aren’t a special snowflake and your words really don’t matter, that publishing is a cutthroat business run by shoemakers who don’t care about books and you can’t trust anyone, that I do have to wonder if some of it isn’t motivated, if unconsciously, by a desire to thin out the competition. And it will work, if you let it, because the chorus is so constant." That hit hard because I think I've been that guy, though not to Marion I hope. I've told people that writing is hard work, getting published is difficult, there is a lot of competition, much relies on luck, and publishing is run by shoemakers who are more concerned with markets and dollars than art and literature because if they weren't, they wouldn't stay in business. Problem is, I think that's all true. In my mind, I'm trying to honestly share a few things that surprised me or I learned the hard way. I don't think blind encouragement is useful. "Winners never quit and quitters never win" can do a lot of harm to people who really should quit and find something else that makes them happy. Clear-eyed perspective is good. I'm trying to help. Marion's got me wondering if I'm doing it wrong. The more I trundle along my own semi-literary semi-career, the more I'm convinced that nobody knows nuthin'. Everybody I know who's "made it" has a different story about how they did it, and their method probably won't work for you. The only way knowing my story would help you is if you had a time machine to travel back to 1983 and beat me out for a part-time night-shift sportswriting job at a small daily newspaper, because that's how I first got paid to write and you surely would have been more qualified than I was. Otherwise, sorry. You're on your own. Shortly after Mom's Cancer was published and had gotten some attention, my editor asked me to meet with a new writer whose first book was about to come out, and give him the straight dope. Writer to writer, heart to heart. We met at the San Diego Comic-Con, and because we couldn't find any chairs we sat on the floor of the mezzanine, between the snack bar and the Klingons. "Getting a book published is cool, and you're going to meet some nice and interesting people," I said. "Enjoy it. But don't quit your day job. The money truck is not going to back up to your door. This is not going to change your life." I summed up my publishing experience as a mixture of profound satisfaction tinged with vague disappointment. You've guessed the punchline. That guy was Jeff Kinney, creator of Diary of a Wimpy Kid, whose series now has about 180 million books in print and two motion pictures to its credit. Jeff still remembers our conversation. We laugh and laugh. Sometimes I can hear the gold coins jingling in the background as he backstrokes through his Scrooge McDuck money vault. My point is, I have proof I'm breathtakingly bad at giving professional advice. Marion says it can seem like writers talk tough to cut down on competition. I understand her perspective but I've never seen it. Usually the opposite; I find writers are very generous with their time, tips and advice. Some are grumpy misanthropes, but more than you'd expect love to talk shop, gossip about agents and editors, and welcome newbies as peers. Sometimes you can't shut them up. Most of them remember what it was like and don't mind lending a hand if they can. It can seem like people ahead of you in the race throw hurdles in your way to stop you, when really those hurdles are just things you need to learn and put behind you, then look back and wonder how they ever slowed you down. I'll take every opportunity to reprint Mark Twain's advice to writers: "Write without pay until somebody offers pay. If nobody offers pay within three years, the candidate may look upon this circumstance with the most implicit confidence as the sign that sawing wood is what he was intended for." Writer Mark Evanier, whose "News from ME" blog is a daily stop of mine, just posted the 13th installment of a possibly-never-ending series he's writing on the topic of Rejection (that post includes links to the previous 12; I'm partial to Part 6 myself, try that one first). If you're wondering why nobody buys your stuff and you can't catch a break and the rules seem stacked against you, Mark has some good insight. I don't. Marion's post, and my demonstrated history of giving spectacularly wrong advice, remind me that humility is in order. I think I could strike a better balance between encouragement and discouragement. I'll try. Do your best work. Get it out into the world however you can. Then do better work. I don't know much but I'm pretty sure that's right. Rats! I blew it already.